Recently, there’s been a huge growth in interest in rear-facing car seats. They’re recommended by experts who have done a variety of studies on how these seats reduce the impact of a crash on the child, in comparison with forward-facing seats. In Sweden, rear facing seats have been the norm since the 70s – when car seats weren’t even a legal requirement in the UK! As a result, Sweden’s child road fatality and injury rates are significantly lower than the UK. However, it’s still rare in the UK for children to be kept rear-facing until the recommended minimum age of 4. We’ve taken a look at some of the facts. If you have a high-impact crash in a forward facing seat, the torso is held in place by the harness, but the head, arms and legs are thrown forward. In a rear facing the seat’s back rest absorbs the impact, protecting the neck and head. Rear facing car seats are up to five times safer than forward facing ones. The risk of serious injury in a high-impact crash is reduced from 40% in a forward facing seat to just 8% in a rear facing one. Rear facing seats reduce the impact on the neck from 300kg (forward facing) to 50kg in a 30mph crash. A child’s head takes up about 25% of their overall weight, compared to 6% in an adult. 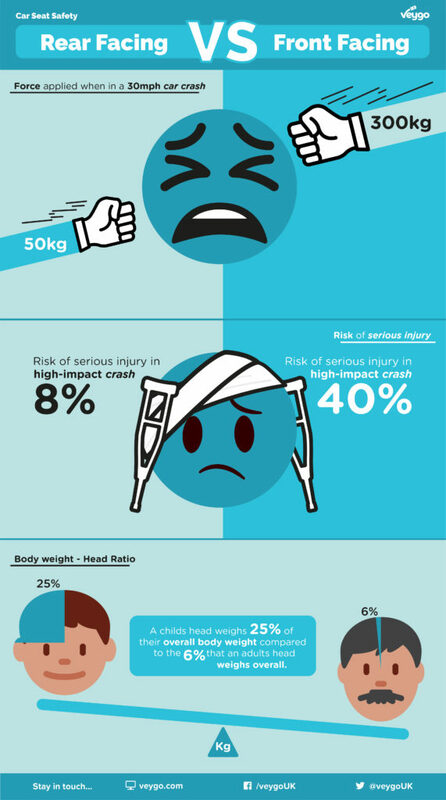 This means, as their head is thrown forward in a crash, they risk serious injuries to their neck. Also, the bones in a child’s spine and neck don’t start to fuse together until around age two or three. So, children need the extra protection that rear facing seats offer. Despite popular concerns, rear facing car seats are much more comfortable for kids than you’d think! A main worry of parents is whether their child’s legs are going to be comfy. The answer is absolutely! Rear facing kids love sitting in a number of different positions. From crossed legs, to legs stretched up the back of the seat. As previously mentioned, children’s skeletons are largely made of cartilage and are more flexible. In terms of breaking their legs, there’s no evidence to suggest that this has happened while a child has been rear facing but it’s common with forward facers. Motion sickness is caused by the mixed signals sent to the brain when you cannot feel the motion your eyes can see or cannot see the motion your body is feeling. This can happen while travelling backwards or forwards. There’s plenty of ways to combat motion sickness if your child is starting to feel a bit ill.
How will it fit in my car? Rear facing car seats tend to take up the same amount of room, or sometimes even less room, than forward facing seats as you don’t need to leave leg space. You can usually check on the manufacturer’s website whether a particular seat will fit in your car. My daughter’s Joie Stages fits in my sister’s tiny Citroen C1! There’s more and more resources popping up about rear facing car seats all the time. Facebook pages such as Rear Facing – The Way Forward are always sharing advice and reviews about rear facing seats. There’s also a great Facebook group called Car Seat Advice UK, which you can use to ask experts for recommendations and/or advice. Car seat manufacturers such as Axkid also provide a wealth of information on car seats. Planning a family trip away? Or need to take the kids to the shops, but don’t have your own car? Check out our Car Sharing Insurance. With cover available from 1 hour to 30 days, borrowing someone else’s car or sharing the driving is super easy.